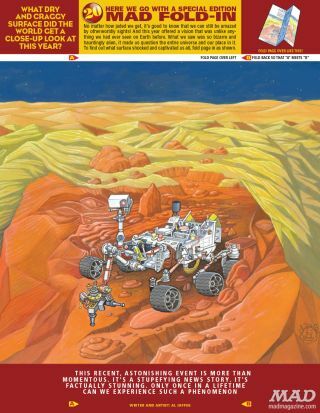 NASA's Mars rover Curiosity appears in the fold-in feature of MAD magazine's 2012 year-end issue, out Dec. 18. NASA's Mars rover Curiosity is exploring some new terrain — the pages of MAD magazine. The year-end issue of MAD, out Dec. 18, spotlights Curiosity in its fold-in, a feature that shifts from an obvious image to a hidden one when the page is folded. The rover shares space with the so-called "Tan Mom," an American woman who gained notoriety earlier this year for her sun-scorched features (and for allegedly taking her five-year-old daughter to a tanning salon). "The main picture is a picture of the Mars rover, and somehow it magically turns into Tan Mom," said artist Al Jaffee, who has drawn every MAD fold-in since the venerable humor magazine introduced the back-page feature in 1964 — more than 400 in all. Curiosity's appearance in MAD further demonstrates the popular appeal of the $2.5 billion robot's Red Planet mission, which began with a dramatic and unprecedented sky-crane landing on the night of Aug. 5. Jaffee thought it was important to render the car-size Curiosity rover fairly accurately, but he added a few creative flourishes here and there. The Curiosity rover disappears and the so-called "Tan Mom" pops up when a page is folded in MAD magazine's 2012 year-end issue. "It really had to look like a real rover," Jaffee said. "But there are some strange things that people at NASA would find very weird. I had a good time with it." Curiosity is chugging around Mars' huge Gale Crater, using 10 different science instruments to determine if the Red Planet could ever have supported microbial life. Though it's only a few months into its surface mission, the robot has already discovered an ancient streambed where water once flowed for thousands of years at a time. Jaffee described the mission as a "phenomenal piece of work" and said he was glad he got the chance to draw Curiosity. "I'm thrilled to be, in a very small way, part of this very exciting world we live in," said the 91-year-old artist, who has won many awards over his long career. "Certainly, the Mars rover is a part of that, and I enjoyed my little role in having fun with it." Drawing so many fold-ins over the years has been a treat for Jaffee, who views the entire collection as a sort of historical document. "You try to comment on issues of interest to everyone, and so it's been like a timeline of the last 50 years," he said. The Dec. 18 issue of MAD is a wrap-up of 2012, featuring the year's "20 Dumbest People, Events and Things."